Great alternate history generator. 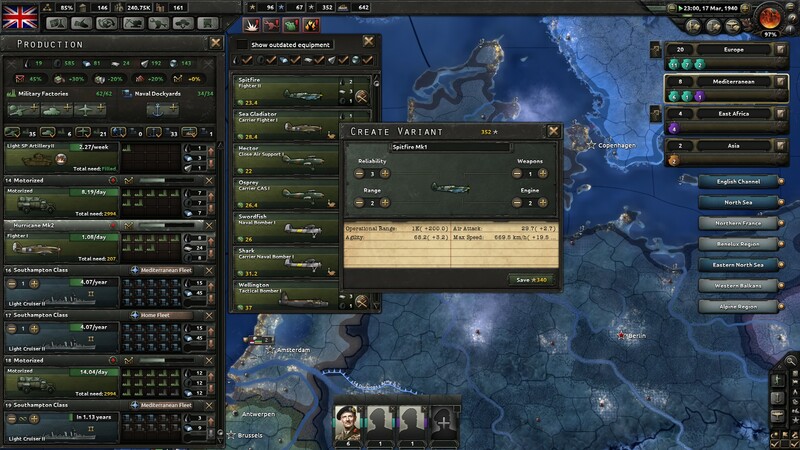 From an emergent narrative perspective, this is perhaps the strongest HOI game thus far. In particular, while the series has always envisioned a three-cornered struggle between fascism, democracy, and communism, HOI4 does a much better job of depicting the Soviet Union as the wild card that it should be. In addition to the usual scripted conflicts against Germany and Finland, the Soviets have additional options to expand into Eastern Europe and the Middle East, potentially bringing them into conflict with the Western bloc. 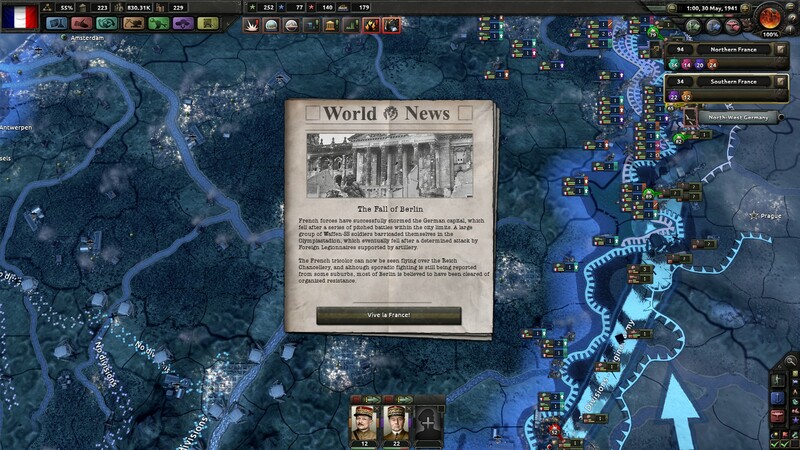 Playing as Britain or France, I’ve had to fight WW3 against the Soviets no fewer than three times. New game mechanics work well. 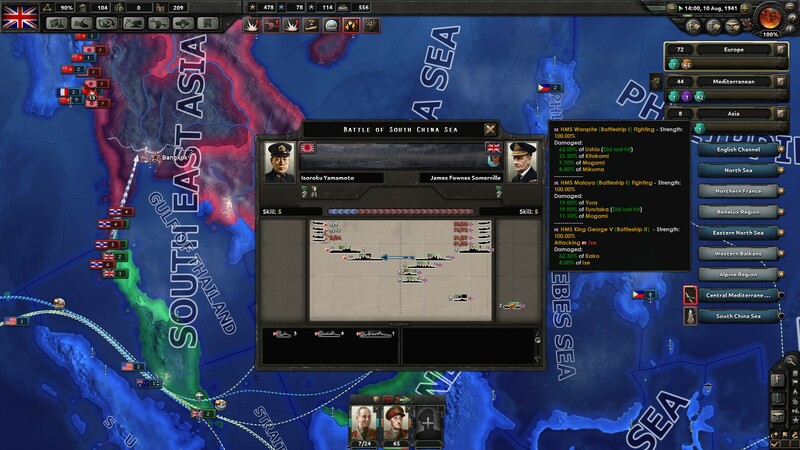 The highlight is HOI4’s new battle plan system (see the screenshot at the top of the page), which represents the successful application of AI automation to a grand strategy game after the interesting, flawed experiment that was HOI3. 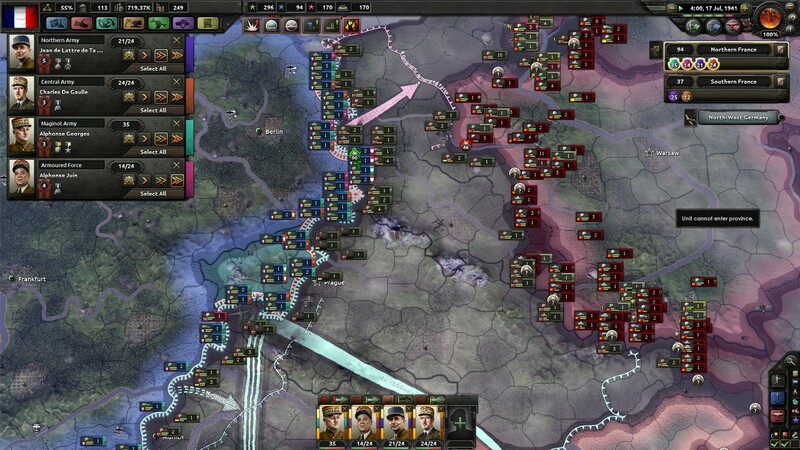 The battle plan system allows the player to (1) assign orders to armies (for instance, ‘hold this line’, ‘advance to this new line’) while (2) retaining manual control as desired. For instance, I prefer to personally command my armoured spearhead, while letting the foot soldiers follow the battle plan. This system does so much for HOI4’s quality of life. It reduces pointless micromanagement, such as shuffling divisions around the front line or supervising one-sided campaigns. It’s especially good at reducing the hassle of moving troops abroad — a big deal when playing maritime powers such as the UK. At the same time, it leaves the player scope for clever tactics, in an acknowledgement that a human general can still out-smart the computer. I wish it were in other Paradox games2! One more system worth mentioning is the way equipment is produced and assigned to units, which HOI4 tracks at a fairly granular level. For instance, a unit doesn’t cleanly upgrade from “1939 medium tanks” to “1941 medium tanks”; instead, new tanks will roll off the production line and replace old tanks as they arrive. As factories take time to gear up, there is a significant lag before new weapons reach the front in meaningful quantities. For instance, while I was producing state-of-the-art Gloster Meteor jet fighters by the end of my British game, the bulk of my fighter force still comprised trusty old Spitfires, accumulated and incrementally upgraded over the years. The effect is twofold. Mechanically, this increases the importance of planning ahead. Thematically, it makes the game feel more like WW2. AI the weakest link. While the AI can generally put up a passable fight, the exceptions stand out. The AI isn’t good at army composition or choosing what equipment to produce3. At launch, it spammed infantry without adequate artillery, anti-tank, or air support – by the end of my British game, the RAF had literally thousands of fighters against zero from the Luftwaffe. While this has improved somewhat following the first patch, and further improvements have been promised, more work remains to be done. Naval AI, the perennial bugbear of Paradox games, remains a problem. I never saw a single U-boat during my entire British game. This is even more acute in the Pacific, where (as in previous HOI games), left to its own devices, the AI will focus on land campaigns on the Asian mainland. This is another area where improvement has been promised, most notably so the Allied AI understands the importance of invading Japan. At an operational level, the AI doesn’t seem to understand defence in depth and strategic reserves. Coupled with its unit production choices, this makes it vulnerable to blitzkriegs — it’s relatively easy for tanks and motorised troops to break through and then pocket sections of the AI’s front line.